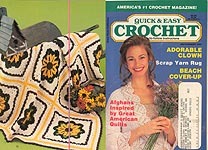 Quick & Easy Crochet was published by Grass Roots Publishing Co. This started out as a digest-size magazine, but changed to full-size in 2004. From the covers, the little digest-size magazines didn't look like much, but contained 80+ pages and a whole lot of really wonderful patterns! They did use a lower- grade paper, though, so the pages are going to be somewhat age-yellowed. 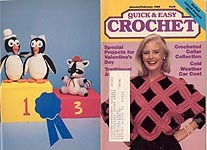 Quick & Easy Crochet, Spring 1986. 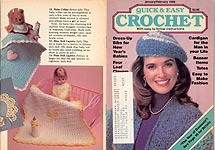 Digest- size magazine; projects include: Pastel Blue Shawl, Filet Star Shawl, Sea Shell Shawl, Yellow Lace Shawl, Wriet Warmers, Clutch, Basketweave Tabard, Cable- Smocked Pullover, Shell Stitch Pullover, Spring Skimmer, Sleeveless Pullover & Hat, Boys'/ Men's Tee- Shirt, Girls'/ Ladies' Tee Shirt, Vanna White's Afghan, Trip Around the World Afghan, Fairy Tale Tulips Afghan & Pillow, Grandmother's Fan Afghan & Pillow, Little Roses Baby Blanket, Lacy Pillow, Pineapple Tablecloth, Placemat, Circular Doily, Q & E Vest & Beret, Lacy Baby Sweater & Cap, Striped Baby Outfit & Blanket, Puppy Purse, Crabby Guy (stuffed crab). Very good condition. 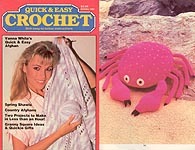 Quick & Easy Crochet, Summer 1986. Digest- size magazine; projects include: Boatneck Pullover, Cherry Blossom Top, Long- Sleeved Pullover, Knot Stitch Bach Bag, Watermelon Bag, Beach Cover- Up, Tank Top, Granny- Trimmed Tee Shirt, Undershirt Trim, Boy's Trunks, Fisherman's Hat, Fisherman's Belt, Baby Bonnet, Baby Booties, Polar Bear Toy, Peach Baby Bikini, Baby String Bikini, Firl's Vest, Boy's Vest, Calico Cat Wall Hanging, Scottie Heart Wall Hanging, Pineapple Pillow Cover, Filet Mesh Pillow, Santa Fe Afghan, Santa Fe Pillow, Napkin Ring, Filet Mesh with Scallop, Shell Edging, Fabric Strip Placemat, Circular Motif Placemat, Charted Designs for Fliet Crochet, Alphabet for Cross Stitch on Afghan Stitch, Scar from address label removal on back cover, Yarn Buying Guide has been cut out of page (along with whatever was on the other side of the page -- looks like stitch guide); otherwise good condition. 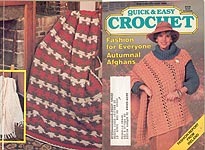 Quick & Easy Crochet, Fall 1986. Digest- size magazine; projects include: Spun Gold Afghan and Pillow, Autumn Leaves Afghan and Pillow, Reversible Striped Afghan, Grandaddy Afghan, Peach Melba Pullover, Cotonia Striped Vest, Regimental Striped Vest, Tattersall Vest, Doll Sweater (chest size 12" , 14" , 16"), Rose Hat & Scarf, Racing Stripes Hat & Scarf, Romantic Hat & Scarf, Gold Pullover, Polo Shirt, Easy Cardigan, Victorian Blouse, Earth Tone Cardigan, "Bargello" Cardigan, Red Blossom Pillow, BLue Blossom Pillow, Teddy Bear Ornaments, Snowflake Afghan, Apple Potholder, Pear Potholder, Anchors Away and Army Stripes Dog Sweaters. Address label on back cover; overall very good condition, though may smell very slightly musty. 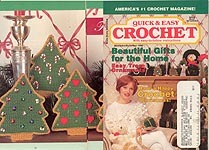 Quick & Easy Crochet, Fall/ Holiday 1986. 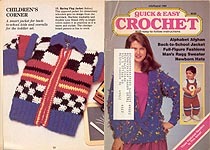 Digest- size magazine; projects include: Winter Coat, Glitter Shawl, Ruby Pullover, Sapphire Cardigan, Confetti Vest, Granny Pullover, Shell Stitch Hat & Scarf, Big Red Scarf, Poodle, Dalmatian, Cocker Spaniel, Mr. & Mrs. Clown, Green Plaid Pillow, Red Plaid Pillow, Santa Claus Doorknob, Bunny Sweatshirt, Piggy Sweatshirt, Annette's Cardigan, One- Square Baby Blanket, Multi- Square Baby Blanket, Ski Bunny Doll, Caroler Doll, Angel Doll, Poinsettia Afghan Poinsettia Tree Skirt & Stocking, Christmas Wreath Afghan & Pillow, Wagon Wheel Afghan, Rose Granny Afghan. Mailing address on back cover, but otherwise very good condition. 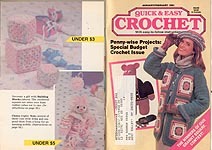 Quick & Easy Crochet, Winter (Jan/ Feb) 1987. Digest- size magazine; Dolman Pullover, Pattern Stitch Vest, Diagonal Granny Sweater, Raglan Pullover, Blazer, Striped Pullover, Cardigan, Cover- Up, Baby Bunting, Valentine's Day Candy Box, Lace Trimmed Hanky, Lace Pillow, Chicky Egg Covers, Shamrock Slippers, Envelope, Eyeglass Case, Scarf, Tote, Pink Collar, Antique Beige Collar, Breakfast Mat, Flower Pot Holder, Butterfly Placemat, Mitt and Two Pot Holders, Three- Star Wall Hanging, Grey Striped Afghan, Meixcana Afghan, Round Pillow, Pastel Popcorn Afghan, Square Pillow. Very good condition. 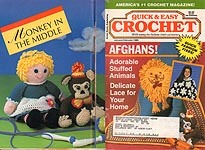 Quick & Easy Crochet, May/ June 1987. Digest- size magazine; "Special Bazaar Issue" projects include: Rag strip Tube Top, Snap Brim Hat, Sea Shell Beach Bag, Eyeglass case, Golden Collar, Striped Collar, Patterned Granny Slippers, Solid Granny Slippers, RIbbed Slippers, Toddler Slippers, Blender & Toaster Covers, Soda Bottle Chef, Apron, Potholders -- Flower Applique, Strawberry Applique, Striped Heart, Little Hearts, Blue and Pink Flowered, Scalloped Edge, and Granny; Oven Mitt, Soap Scrub Bag, Bath Tissue Cover, Tissue Box Cover, Pomander, Sleep Pillow, Sachet Hanger, Bath Powder Cover, Perfume Pocket, Two Chicks Bib, Funny Feathers Bib, Booties, Clothespin Bag, Rooster Bib, Wee Worm, Bitty Butterfly, Teeny Teddy, Petite Pony, Beaded Evening Bag, Hamburger, Hot Dog, Slice of Cake, Flowered Openwork Pillows, Embroidered Afghan Stitch Pillows. Very good condition. 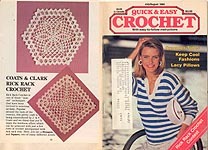 Quick & Easy Crochet, July/ Aug 1987. Digest- size magazine; projects include: Mesh Pullover, Summer Hat, Lace Collar & Cuffs, Multi- Color Vest, Irish Rose Bag, Oreo Magnets, Butterfly Magnets, Watermelon Magnets, Lace Wall Basket, Appliqued Box, Old-Fashioned Girl doll, Striped Runner, Goosetracks Pillow, Log Cabin Chair cushions, Crocheted Penny Rug, Potholder Duck & Goose, Lacy Shelf Trim, Flowered Edging, Flowered Net Placemats, Wildflower Cameo, Daffodil Teacloth, Sheepish Sheep, This Little Pig, Western Vest, Pastel Shell Pullover, Alphabet Carriage Blanket, Ruffled Pillow, Baby Sweater and Hat. Very good condition. 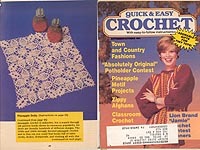 Quick & Easy Crochet, Sept/ Oct 1987. 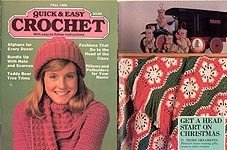 Digest- size magazine; "Granny Square Motif Special" projects include: Shawl Collar Jacket, Man's Diamond Sweater, Harlequin Sweater, Peach Shawl, Shoulder Bag, Fliet Top & Skirt, Trimmed Sweatshirt, Cuffed Slippers, Net Scarf, Granny Bag, Pink Sweatshirt Trim, Ruffled Bonnet, Blue Sweatshirt Trim, Miss Muffet Hat, Granny Lap Robe, Flower Garden Afghan, Americana Afghan, Ribbons & Lace Pillow, Openwork Cushion & Bedspread, Teacart Mat, Placemat & Tea Cozy, Semi- Circle Clutch, Rectangular Clutch, Black & White Clutch, Christmas Tree, Holiday Adghan, Square and Round Net Pillows, Country Pillow, Roll Pillow, Lacy Tablemat. Very good condition. 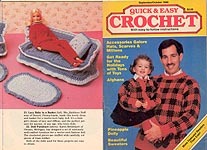 Quick & Easy Crochet, Nov/ Dec 1987. Digest- size magazine; "Holiday Crochet" projects include: Cover Girl Coat, Apres Ski Sweater, Silver Pullover, Silver & Crystal Snood, Net Yoke Top, Gold Headwrap, Wrap Around Robe, Toddler Dress, Earmuffs, The House Pillow, The Boat Pillow, Santa Puppet, Squirrel, Three Little Kittens (Snowball, Domino, Tiger), Angels, Cone Pocket, Granny's Heart, Holiday Cards, Open Heart, Matchboox Cover and Napkin Ring, Heart Mobile, Shelf Trim, Christmas Ball Potholders, Elf Potholder Wreath, Napking Ring & Wax Guard, Santa Place Markers. 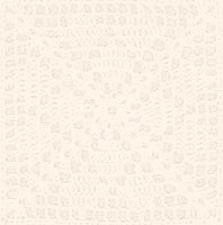 Openwork Doily, Yuletide Runner. May have mailing label on front cover, but otherwise very good condition. 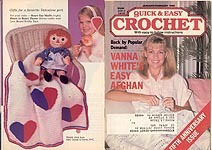 Quick & Easy Crochet, Jan/ Feb 1988. 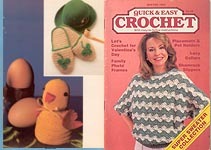 Digest- size magazine; Circular Potholder, Striped Potholders, Clover Bookmark, Four- Leaf Clover Pin, Valentine Bookmark, Two Hearts Pin, Napkin Rings, Valentine Doily, Tuxedo Bib, Evening Gown Bib, Puff Crib Blanket, Baby Collar, Blue Doll Layette (blanket, bib, bottle holder for 12" - 15" doll), Pink Doll Layette (same for 16" - 18" doll), Diamond Vest, Cocoon Jacket, Beret, V- Neck Pullover, Poncho, Embroidered Pullover, Man's Cardigan, Lace Yoke Sweater, Peach Pullover, Striped Pouch, Net Tote, Hairpin Lace Afghan, Zig Zag Pillow, Pincushion, Lavender Bg, Crochet Edging, Seven Stars Centerpiece, Ombre Border Doily. May have address label on cover or bottom corner of cover bent, some wear, but otherwise very good condition. Quick & Easy Crochet, Mar/ Apr 1988. Digest- size magazine; Pretty Daffodils, Mr. Bunny, Party Chicks, Rooster and Hens, Egg Cover Chicks, Flowered Egg Covers, Flowers 'n' Lace, Drawstring Bag, Mesh Collar, Circular Motif Collar, Pastel Pullover, Zig Zag Vest, Pajamas, Mother/ Daughter Top, Pencil Case, Zip Front Jacket, Loop Stitch Pullover, Contemporary Afghan, Granny Square Placemat, Flowered Placemat, Flower Potholders, Spring Chicks Potholders, Sunshine Potholders, Striped Bib, Granny Blanket, Shell Stitch Bonnet, striped Booties, Textured Booties, Embroidered Bonnet, Eyelet Bonnet, Long Curtains, Cafe Curtains, Placemat/ Tablerunner, Net Squres Tablecloth. Mailing label on cover, but otherwise very good condition. 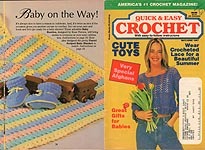 Quick & Easy Crochet, May/ June 1988. Digest- size magazine; Winged Dragon, Little Unicorn, Panda, Elephant, Teddy, Lamb, Lion, Braided Belt, Belt Bag, Patterned Belt& Matching Bag, Openwork Shawl, Glitter Shawl, Tank Top, Knotted Vest, Filet Mesh Vest, Lacy Top, Crossee Vest, Long Vest, Bathing Suit, Beach Wrap, Sunbathing Top, Patchwork Sweater, Square Knot Sweater, Baby Set (Sacque, Cap, Mittens, Booties), Scallop Layette ( Jacket, Bonnet, and Booties), Deckchair Cushion, Flowered Tablerunner, Hairpin Lace Pillow, Ruffled Doily, Squere Doily, Placemat and Napkin. Mailing label and/or former owner's name on cover, but otherwise very good condition. 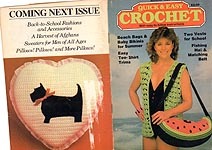 Quick & Easy Crochet, July/ Aug 1988. Digest- size magazine; Newborn Hats, Keepsake Frame, Gingerbread Boy doll, Man's Ragg Pullover, White Halter, Tank Top, Pink Halter, V- Neck Vest, Verticle Stripe Pullover, Two- Tone Cardigan, Popcorn Pullover, Heart Afghan, Plaid Afghan, Child's Racing Flag Jacket, Toddler Overalls, Tablecloth Edging, Heart Vest, Appliqued Roses, bell Pull, Large and Small Plate Doilies, Autumn Leaves Potholders, Egg Basket Lid, Flowered Napkin Rings, Scalloped Edging, Tied Napkin Rings, Flowered Edging, Blue and White Lace Tablecloth, Round Doily, Double Square Doily. May have mailing label on cover or cover wear with cover torn by staples; otherwise very good condition. 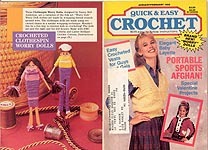 Quick & Easy Crochet, Sept/ Oct 1988. Digest- size magazine; Pink Beret, Scarf, & Mittens Set, Popcorn Hat, Scarf, & Mittens Set, Dicky, WHite Baby Hat, Lazy Daisy Baby Hat, Striped Baby Hat, Hooded Baby Scarf, Sporty Pullover, Romantic Sweater, Dad & Daughter Cardigan and Buffalo Plaid Pullover, Checker Board Pullover, Purple Pullover, Town & Country Set (Hat, Scarf, Mittens), Knit- Look Cap, Crayon Colors Set ( Hat, Scarf, Mittens), Giraffe, Mice, Lion Cushion, Puppy Puppet, Lacy Baby in a Blanket (12" baby doll) christening outfit), Doll Furniture (Fashion doll Couch, Chair, Footstool, Pillows, Rug), Ruffled Clown, Pompon Poodle, Ric Rac Afghan, Spider Web Afghan, Wagon Wheel Afghan, Red Doily, Pineapple Doily, Plaid Potholders. Mailing label on back cover; otherwise very good condition. 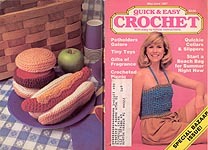 Quick & Easy Crochet, Sept/ Oct 1988. Digest- size magazine; Pink Beret, Scarf, & Mittens Set, Popcorn Hat, Scarf, & Mittens Set, Dicky, WHite Baby Hat, Lazy Daisy Baby Hat, Striped Baby Hat, Hooded Baby Scarf, Sporty Pullover, Romantic Sweater, Dad & Daughter Cardigan and Buffalo Plaid Pullover, Checker Board Pullover, Purple Pullover, Town & Country Set (Hat, Scarf, Mittens), Knit- Look Cap, Crayon Colors Set ( Hat, Scarf, Mittens), Giraffe, Mice, Lion Cushion, Puppy Puppet, Lacy Baby in a Blanket (12" baby doll) christening outfit), Doll Furniture (Fashion doll Couch, Chair, Footstool, Pillows, Rug), Ruffled Clown, Pompon Poodle, Ric Rac Afghan, Spider Web Afghan, Wagon Wheel Afghan, Red Doily, Pineapple Doily, Plaid Potholders. Cover wear, cover torn by staples; otherwise very good condition. 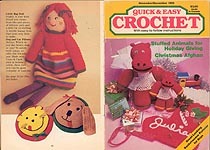 Quick & Easy Crochet, Nov/ Dec 1988. Digest- size magazine; "Decorate with Crochet for the Holiday Season" : Ripples & Lace Baby Afghan, Through My Window Afghan, Country Goose Afghan, Motif Coasters, Victorian Afghan & Pillow, Ballet Shoes Ornaments, Toddler Dress, Pixie Hat, Greeting Cards (Pixie Girl, Angel, Falling Star, Pine Cone, Poinsettia, and Heart appliques), 6 Snowflakes, Large Star, Angel Ornament, Striped Stocking, Poinsettia Heart, Pine Tree Stocking, Holiday Potholder, Christmas Doily, Noel Place Setting, Diamond Pullover Sweater, Patchwork Top, Openwork Beret, Motif Pullover, His Pullover, Log Cabin Pillow, Cor- Plaid Afghan. Mailing label on back cover; otherwise very good condition. 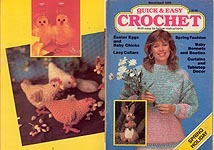 Quick & Easy Crochet, Jan/ Feb 1989. Digest- size magazine; Bride and Groom Penguins, Shaggy Dog, Raccoon, Cat and Kittens, Mallard Duck, Goldfish, Alley- Gator, Pennsylvania Dutch Curtains, Hart Runner, Pineapple Heart Pillow, Heart Placemat and Matching Napkin, Country Car Coat, Sweetheart Cardigan, Diamond Motif Pullover, Mohair Dolman, Right Angle Pullover, Jewel- Tone Granny Afghan, Bassinet Tissue Box, Openwork Baby Afghan, Home Sweet Home filet, Chevron Granny Afghan, Flowered Granny Afghan, Lacy Runner and Doily, Filet Mesh Potholder, Granny Potholder, Lover's Knot Collar, Pineapple Fan Collar, Round Lacy Collar, Wheel Collar. Mailing label on front cover; otherwise, very good condition. 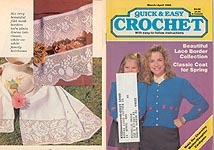 Quick & Easy Crochet, Mar/ Apr 1989. Digest- size magazine; Peplum Jacket, Lacy Pink Pullover, Openwork Pullover, Spring Pullover, Jeweled Bolero, Wedding Dress Top, Regal and Petal Bridal Crowns, Pansy Trimmed Flower Basket, Old Fashioned Doll (2" - 2-1/2" china doll waist to head body required), Trousseau Apron, Pale Blue Flower Tablecloth & Pillow Set, Pink Roses Bedspred & Pillow Set, Leaf Panel Afghan, Flowered Granny Afghan and Pillow, Filet Mesh Pillow, Medallion Pillow, Lace Wheel Pillow, Texture Stitch Pillow, Covered Hangers, Grandma Doll, Child's Spring Dress, Circus Elephant, Child's Tyrannosaurus Rex Vest, Child's Loop Vest, Loop Bib, Donkey, Frog Prince. May have mailing label on front cover. Otherwise, good condition. 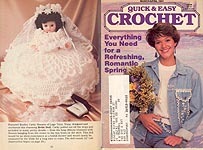 Quick & Easy Crochet, May/ June 1989. Digest- size magazine; Scallops and Stripes Sweater, Multicolor Diamonds Sweater, Block Pattern Pullover, Slippers for the Family, Picot Lace Shawl, Purple Motif Shawl, Shoulder Wrap, Broomstick Lace Shawl, First Prize Granny Square Afghan, Second Prize Welcome Mats, Third Prize Baby Blanket, Lacy Granny Gag, Casserole Tote, Bull's Eye Potholders, Pink Rectangular Granny Aghan, Peach/ Brown Rectangular AFghan, Schoolhouse Afghan, Optical Options Afghan, Shattered Square Afghan, Rainbow Prism Afghan, Ship's Wheel Afghan, Toddler Dress, Carnations, Baby Girl Bear, Butterfly Blanket. Mailing label residue on front cover, but otherwise very good condition. Quick & Easy Crochet, July/ Aug 1989. Digest- size magazine; Wildflower Tote, Red- White- & Blue Tote, New Wave Tote, Lightning Pullover, Sparkle Pullover, Skinny Stripes, Bold Stripes, Tank Top, Lean Line Cover- Up, Rick Rack Crochet Instructions, Hexagon, Square, Rick Rack Crochet Pillow, Flowered Filet Tablecloth, Crossroads Pillow, Daisy Pillow, Rose Pillow, All Purpose Project, Lion Rug, Turquoise Mat/ Napkin Ring, Flosered Placemat and Napkin. Mailing label on front cover; otherwise, very good condition. 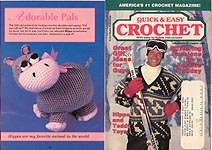 Quick & Easy Crochet, Sept/ Oct 1989. Digest- size magazine; Abstract Alphabet Sweater, Pink Popcorn Top, Lace Collar Rompers, Blue and White Party Dress, Green Party Dress, Quickie Collar, Crocheted Collar,Tyrolean Jacket, Mother/ Daughter Shell Stitch Pullovers, Cropped Hacket, Long Line Cardigan, White Afghan Stitch Pillow, Rust Afghan Stitch Pillow, Granny Square Pillow, Autumn Potholders, Pleated Coaster, Starburst Placemat and Napkin Set, Patchwork Block Afghan, Scallop Illusions Afghan. Mailing label on front cover; otherwise, very good condition. 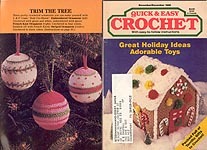 Quick & Easy Crochet, Nov/ Dec 1989. Digest- size magazine; Diamond Border Pullover, Victorian Christmas Afghan, Treat Baskets, Basketweave Pullover, Glitter Flowers, Christmas Stocking, Mama Hippo, Baby Hippo, Prickly Porcupine, Well- Bred Whale, Friendly Doll Pillow, Bunny Baby, Kitty Baby, Puppy Baby, Little Rag Doll, Dog Pillow, Cat Pillow, St. Bernard, Openwork Place Setting. May have mailing label on front cover; otherwise, very good condition. Quick & Easy Crochet, Jan/ Feb 1990. Digest- size magazine; Vanna's Afghan, Jiffy Afghan, Two- In- One Dress, Jiffy Pulloer, Geometric Pullover, Fisherman Pullover, Stained Glass Afghan, Ripple Afghan, rugged Country Afghan, Cable Square Afghan, Victorian Floral Afghan, Little Lamb Pin, Heart Ear Muffs, Heart To Heart Throw, Towel Trims, Doily, Circle Bib, Block Baby Afghan, Cheron Baby Blanket, Flower Motif Blanket, Openwork Scallops Baby Blanket. Very good condition. Quick & Easy Crochet, Mar/ Apr 1990. Digest- size magazine; Springtime Baby Blanket, Duckling, and Bonnet Set; Baby Rick Rack Dress, Little Girl's Goodie Bag, Classic Coat, Mother & Daughter Cover Girl Cardigans, Jewel Stitch Pullover, Granny Square Shawl, Lacy Squares Shawl, Pastel Ripple Afghan, Spring Garden Afghan, Icicle Stitch Afghan, Pranding Deer Border, Chain Border, Geometric Border, Rose Border, Fleurs- de- Lis Border, Fruit Garland Border, Lamp Table Toily, Circular Doilies, Filet Mesh Rose Pillow, Victoriana Doily. Address label on front cover, but otherwise very good condition. 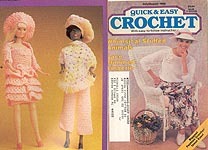 Quick & Easy Crochet, May/ June 1990. 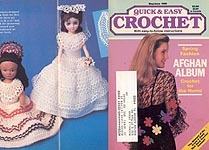 Digest- size magazine; Shawl Bolero, Evening Scarf, Flower Earrings, Black Lace Shawl, Cowl Neck Pullover, Black & White Applique top, Rick Rack Crochet Pinafore, Rick Rack Crochet Place Setting, Rick Rack Crochet Doll Dresses (for 14" - 15" doll), Rick Rack Collar, Rick Rack Basket and Doily, Little Guy's Vest, Jewel Tone Afghan, Diamond Granny Afghan, Gingham AFghan, Popcorn Afghan, Rhapsody in Blue Afghan, Gold Crown Doily, Lace Motif Runner, squares and Circles Doily, Openwork Flower Motif. Address label on front cover, but otherwise very good condition. 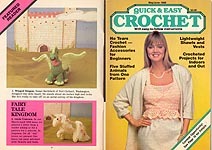 Quick & Easy Crochet, Jul/ Aug 1990. Digest- size magazine: Miss Hippo Ballerina, Colonel Walter Walrus, Fashion Doll Wardrobe, Summer Hat, Grape Cluster Pullover, Summertime Belt Trio, Cutwork Crochet for Tee Shirt, Nightshirt with Lace insert, Color Striped Pullover, Granny Square Appliqued Pullover, Diagonal Striped Sleeveless Pullover, Zig Zag Pattern Cardigan, Summer Rolled Brim Hat, Striped Two- Piece Suit, Boa Collar Sweater, Embroidered Polo, Ribbon- Trimmed Cardigan, Pastel Striped Toddler Dress, Scallop Edge Potholders, Openwork Potholders, Tropical Fish Pothoders. Cover ripped/ pulled slightly at staples, mailing label on front cover. Quick & Easy Crochet, Sept/ Oct 1990. Digest- size magazine: Marine and Cerise Pullover, Robin Blue and White Pullover, Trimmed Vest, Snap Brim Winter Hat, Openwork Shawl, Raglan Sleeve Turtleneck, Scallop Patterned Hood, Tweed Turtleneck, Test Pattern Pullover, Boy's Medallion Blazer, Irish Chain Afghan, Checkered Afghan, Country Quilt Afghan, Aran Look Afghan, Spike Cluster Afghan, Heritage Doily, Celebration Outfit for baby, Crocheted Apple. Mailing label on cover, but otherwise very good condition. Quick & Easy Crochet, Nov/ Dec 1990. 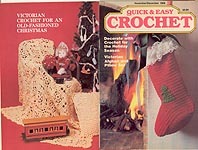 Digest- size magazine; "Holiday Crochet" projects include: Crocheted Ball, Heirloom Oval Tablecloth, Choir Boy, Angel, Santa Wall Hanging, Gingerbread House, Lopi Jacket, Frivoli Vest, Scraps Sweater, Granny Square Puppy Coat, FiFi's Coat (dog), Rag Style Rug, Southwest Tote Bag, Southwest Pillow, Southwest Lap Robe, Three Ornaments (ball covers), Geometric Baby Blanket, Patriotic Granny, Elegant Suit (ladies'), Snowman & Snowlady, Purse/ Cradle, Mr. Aroma toy skunk. Good condition. Quick & Easy Crochet, Jan/ Feb 1991. Digest- size magazine; projects include: The Great Lace Scarf, Striped Beret, Jacket in a Jiffy, Glitter Pullover, Delicate Handkerchief, Picot Lace Collar, Dusty Rose Edging, Popcorn Edging, Cathedral Edging, Hexagon Afghan, Step Pattern Afghan, Shamrock Afghan, Birthday Cake Afghan, Traditional Granny Bedspread & Pillow Set, Granny Bouquet Picture, Puxxle Placemat, Ruffled Baby Afghan, Reversible Scallop Baby Blanket, Bunny Sweater & Booties, Building Blocks, Clown, Sophisticated Hippo, Flowered Napkin Rings, Scalloped Edging, Tied Napkin Rings, Flowered Edging. Good condition. Quick & Easy Crochet, Mar/ Apr 1991. 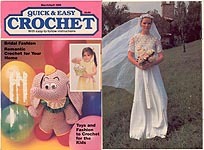 Digest- size magazine; projects include: Rag Doll, Rag Slippers, Star Boudoir Pillow, Motif- Trimmed Sleeveless Tee, Sampler Aghan, Boy's Pullover, Giant Granny Square Blanket, Pastel Blocks Pullover, Boudoir Pillow, Ruffled Toddler's Dress, Flowered Toddler Cardigan, Floppy Eared Bunnies, Bride Doll (13"), Long- Sleeved Pullover, Pillowcase, Multi-Color Granny Afghan, Woven Boudoir Pillow, Starburst Baby Blanket, Large & Small Picture Frames, Doily, Silver Roll, Denim & Lace trims. Good condition. 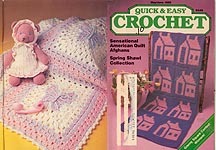 Quick & Easy Crochet, Jul/ Aug 1991. Digest- size magazine; "Bazaar Bonanza" projects include: Summer Scallops Afghan, Floral Afghan, Chevron Popocorn Afghan, Fair Isle Sweater Set (girls), Childrens' Sailboat Sweater, Baby's Umbrella Vest, Childrens' Monogrammed Pullover, Misses' Embroidered Mesh Pullover, Eyeglass Case, Squash Beach Bag, Evening Bag, Lacy Collar, Cornflower Potholders, Fish Potholder, Crocheted Lace, Sparkling Star Motif (Placemat, Pillow Doily, Light Catcher, Tablecloth), Mesh Napkin Rings, Square Potholders, Shelf Edging, Candy Jar Covers, Summer Wreath, Tote Bag, Slippers, Jar Cover, Sunset Doily. Cover problems, but otherwise good condition. Quick & Easy Crochet, Sept/ Oct 1991. Digest- size magazine; projects include: Heather Tones Child's Pullover, Laxy Dasy Child's Pullover, Puppy Purse, Toddler Sweater, 1st Prize Baby's Jacket & Overalls, 2nd Prize Baby Blanket, 3rd Prize Baby Blanket, Openwork Doily, Wagon Wheel Napkin Ring, "Indy 500" afghan, Golden Lace Afghan, Misses' Coco Jacket, "Roses" Peplum Vest, Crocheted Lace, Pineapple Pilow, Pinepple Doily, Pretty Collar, Autumn Cover Girl Misses' Sweater, Striped Potholder, Aran Potholder, Hexagon Potholder, Circle Pothodler, Filet Mesh Potholder, Shelf Edging. Good condition. Quick & Easy Crochet, Jan/ Feb 1992. Digest- size magazine; projects include: Flowered Baby Bunting, Lace Motif Baby Throw, Elegant Baby Layette (Jacket, Bonnet, Booties), Stitch Sampler Blanket and Pillow, Cambridge Best, Man's Mohair Vest, Pretty Pineapple Pullover, Angel Yoke Cardigan, Happy Hearts Cardigan, Pineapple Lace Collar, Crocheted Clothespin Worry Dolls, Heather Afghan, Portable Sports Afghan, Valentine Potholders, Popcorn Circles Pillow cover, Popcorn Lattice Eyeglass Case, Ruffled Tray Cloth and Napkin Ring, Openwork Pillow Cover, Geometric Cart Mat, Blue and White Tablecloth. Mailing label on cover, some cover wear but pages in very good condition. Quick & Easy Crochet, July/ Aug 1992. Digest- size magazine; projects include: Welcome Home Afghan, Betsy Ross Afghan, Teddy Bear's Picnic Afghan, Checherboard Blanket, First Prize Palimino Potholder, Second Prize Popcorn Potholder, Third Prize Sailboat Potholder, Heart Bandana, Summer Lace- Up Top, Stars & Stripes Pullover, Fruit- Striped Shell, Blossom Pullover, Southwest Bandana, Gum Drop Sleeveless Cardigan, Gossamer Slipover, Scalloped Handkerchief Edging, Lace Handkerchief Edging, Fashion Doll Sweetheart Ball Gown, Lavender Prom Dress, Sunflower Sun Dress, Flower Garden Runner, Cafe Curtains, Light Catcher. Front cover a total mess -- bottom third missing completely, price crossed off. Rest of magazine is in surprisingly good condition. Quick & Easy Crochet, Mar/ Apr 1993. 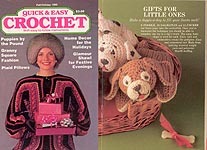 Digest- size magazine; projects include: Pineapple Tray, Baby's Bunny Sweater Set, Floppy- Eared Bunny, Paddy's Potholders, Snap Brim Hat, Easter Eggs, Filet Butterfly Tea Set, Striped Tea Cozy, Ruffled Toddler Dress, Ribbed Baby Bonnet, Openwork Baby Bonnet, Sea Quilt, Geometric Man's Pullover, Nautical Stripes Pullover, Tri Color Suit (Misses' sizes), Parisian Suit, Casual Jacket, Lace Motif Runner,Four- Motif Doily, Sunburst Quilt, Openwork Jacket. Mailing label on cover, some cover wear but pages in very good condition. Quick & Easy Crochet, Nov/ Dec 1993. 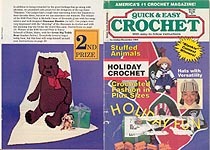 Digest- size magazine; projects include: Peacock Doily, Lattice Hanky Edging, Fan & Leaves Doily, Chenille Pillow, Beret & Scarf Set, Super Easy Jacket, Christmas Quilt, Holiday Afghan, Reindeer Rug, Christmas Stocking, Pine Tree Edging, Holiday Filet Square, Noel Filet Square, First Prize Bear, Second Prize Bear, Third Prize Bear, Teddy on a Swing, Holiday Banners. Tag on cover, scar from mailing label removal, some cover wear but pages in very good condition. Quick & Easy Crochet, Nov/ Dec 1994. 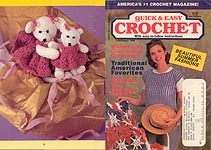 Digest- size magazine; projects include: Triangle Pattern Hat, Stripe Pattern Hat, Beret, Floppy Brim Hat, Last- Minute Mittens, Crocheted Art, Three Dogs, Three Cats, Double- Breasted Cardigan, Basketweave Pullover, Dinosaur "Blankie", Great Big Teddy Bear Afghan, Pastel Panels Afghan, Holly Leaf Garland, Tree Skirt, Cover Afghan, Holiday Centerpiece, Holiday Hot Plate, Step- Pattern Afghan, Granny Square Sweater, Stripes & Lace Pullover, Mondrian Sweater. Tears on cover by staples, cover is kind of a mess, but pages in good condition. Quick & Easy Crochet, Jan/ Feb 1995. 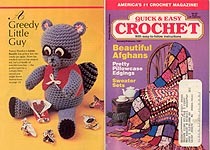 Digest- size magazine; projects include:Dora Lee Doll, Mr. Monkey, Daisy Doll, Oval Potholder, asymmetrical Pullover, Granygons Pullover, Snowflake Motif Vest, Cap- Scarf- Bag Set, Funky Hat, Valentine Afghan, Bargello Pillow, Lion Afghan, Polygon Afghan, Evening Pullover, Cross- over Vest, Double pIneapple Doily, Six- Petal Tablecloth, Ebb Tide Doily, Starburst Runner. Cover wear at staples, but otherwise good condition. Quick & Easy Crochet, Sept/ Oct 1995. Digest- size magazine; projects include: Man's Al Pa Ka Cardigan, Gingham Cropped Top, Pinwheel Lace Pullover, Autumn Gold Tunic, Motif Cardigan, Classic Mock Turtleneck, Chenille Baby Blanket, Hooded Baby Sweater, Ripple Baby Blanket, Criss-Cross Baby Set, Home Sweet Home Afghan, Shells & Waves Afghan, Bride Doll Pillow Doll (15"), Love Pillow, Eight- Pineapple Doily, Place Mat & Napkin Ring, Rose Cluster Doily, Leafe Frame Mat, Made It Myself. Cover damaged, but pages in good condition. May smell slightly MUSTY. 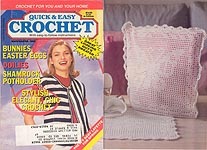 Quick & Easy Crochet, March/ Apr 1996. Digest- size magazine; projects include: Duck Motif Tote, "Motif by Motif," Midnight Lace Shawl, Black Mesh Stole, Rose Pullover, Bath Mitt, Spider Web Doily, Victorian Throw, Hexagon Flowers Afghan, "Baby Boy" Blanket, Tanglefoot Bunny, Cindy Octopus, My House Afghan, Pastel Ripple Blanket, Hanky Edgings, Three Bookmarks, Santa's Helper Kids' Sweater. Mailing label on front cover, but otherwise very good condition. Quick & Easy Crochet, May/ Jun 1996. Digest- size magazine; projects include: Grapevine Mats, One- sleeved Shawl, Ruffled Granny Blanket, Quick & Easy Man's Vest, Motif by Motif Part II, Woven Blues Afghan, Summer Garden Afghan, Seaside Baby Blanket, Popcorns & Diamonds, Bubbafly, Fingerless Gloves, Golden Summer Shawl, Easy Motif- Panel Vest, Red Lace Vest, Light Mesh Pullover, Diamond Mat & Hot Pad, Rosette Suncatcher, Noel Filet Square. Mailing label on front cover, but otherwise very good condition. May smell MUSTY. 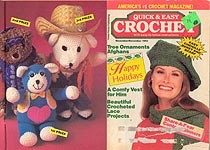 Quick & Easy Crochet, Jul/ Aug 1996. Digest- size magazine; projects include: Polka Dot Dress, Rainbow Baby Afghan, Pastel Motifs Blanket, Blue Mood Doily, Three Towel Trims, Babusitting Bears, Musical Michael, Red- White- & Blue Afghan, Six- Pointed Star Afghan, Welcome Mat, Vertical Stripes Top, Lace- Up Vest, Stripe-Play Pullover, Bolero Jacket, Openwork Lace Tunic, Striped Summer Tee, Motif by Motif Part 3, Tiny Doilies for Applique. Mailing label on front cover, but otherwise very good condition. Quick & Easy Crochet, Sep/Oct 1996. 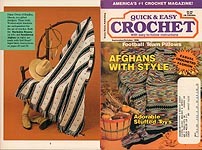 Digest- size magazine; projects include: Football Pillows, Jewel Tone Afghan, Buckskin Beauty Afghan, Southwest Afghan, Tri- Colored Striped Afghan, Bright Geometrics Cardigan, Crocheted Tote, Man's Cardigan & Vest, Kaleidoscope Pullover, Chipper Canary & Skipper Duck (Chipper & Skipper), Golden Lace Stole, Holiday Headstart Place Setting (Placemat, Coaster, Napkin Ring), Gold Dust Doily, Wheat Clusters Motif. Mailing label on front cover, but otherwise very good condition. 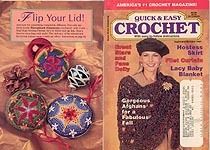 Quick & Easy Crochet, Nov/ Dec 1996. 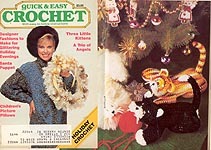 Digest- size magazine; projects include: chevron Striped Top, Petal Pullover & Beret, Fashion Doll Square Dance Dress, Elmer Elephant, Four Easy Ornaments, Christmas Tree Quartet, Little Angels, Candle Wreath, Hobby Horse Ornaments, Popcorn Lace Trim, Cuddler Afghan, Grannies with Tassels, Dusty RoseDoily, Candy Cane Stocking, Monogrammed Stocking, Around the World Tree Skirt, Motif by Motif Part 5, Warm Up America. . Mailing label on front cover, but otherwise very good condition. May smell slightly MUSTY. 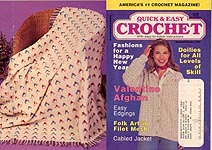 Quick & Easy Crochet, Jan/ Feb 1997. 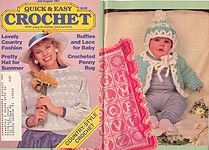 Digest- size magazine; projects include: Motif by Motif Part 6, ABC Valence, Baby Bib, Little Bandit, Pillowcase Edgings, Bed Set, Pastel Shells Afghan, Grapevine Afghan, Teal Sweater Set, Rose Sweater Set, Sleeveless Pullover, Burgundy Lace Tunic, Lace Scarf, Multi Color Afghan. Mailing label on front cover, but otherwise very good condition. 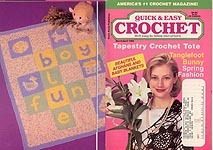 Quick & Easy Crochet, May/ June 1997. Digest- size magazine; projects include: Summer Lace Cardigan, Denim Lace Top, Hippy Tank Top, "Spring Has Sprung" Necklace, Fabulouse Filet (Large Pillow, Potpourri Pillow), Peach Hearts Pillowcases, Medallion Table Runner, Jewel Tone Afghan, Raised Stars Afghan, Baby Booties, Pastel Striped Baby Blanket, Olivia Octopus, Tommy Turtle, Hearts & Arrows Doily. Center page detached from staples (but included), mailing label and some writing on front cover; otherwise good condition. 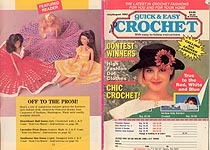 Quick & Easy Crochet, Jul/ Aug 1997. 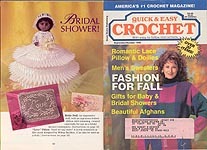 Digest- size magazine; projects include: LAce Edged Cardigan, Beach Cover- Up, Lamb Clown, Victorian Christmas Bells, Fabulous Filet, Part 3, Oval Centerpiece, Starched Doily, Sea Shell Bath Set, Blue Gingham Afghan, Sunshine and Shadow Afghan, Sunflower Quilt, Patchwork Quilt, Scrap Yarn Rug, Lacy Jar Covers. Mailing label on front cover, but otherwise very good condition. 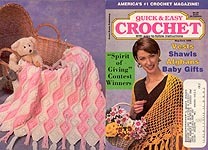 Quick & Easy Crochet, Sept/ Oct 1997. 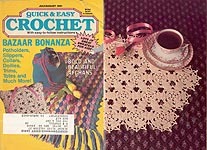 Digest- size magazine; projects include: Triangular Shawl, Hostess Skirt, Threadwork Ornaments, Autumnal Glow Afghan, Tumbler Afghan, Popcorn Afghan, Diamond Baby Set, Lacy Baby Blanket, Fabulous Filet Part 4, Stars and Fans Doily, Holiday Centerpiece, Washcloth Edgings, "Monkey See" Curtain. Mailing label on front cover, but otherwise very good condition. May have slight MUSTY smell. Quick & Easy Crochet, Nov/ Dec 1997. 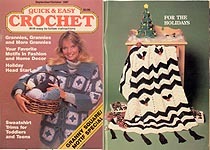 Digest- size magazine; projects include: Holiday Tablecloth, Home Sweet Home, Weat Cluster Doily, Tree Ornaments, Woven Plaid Afghan, Lace Afghan, Diamond Afghan, African Afghan, Little White Skirt, Ski Sweater, Outdoor Jacket, Poncho, Hippo, Teddy, Fabulous Filet, Part 5. Mailing label on front cover, but otherwise very good condition. May have slight MUSTY smell. Quick & Easy Crochet, Jan/Feb 1998. Digest- size magazine; projects include: Cabled Jacket, Striped Rib Pullover, Vertical Stripe Pullover, Glitter Top, Pineapple Delight, Pretty in Pink Doily, Little Celebrity Doily, Wedgewood Flowers Afghan, Primary Stars Afghan, Textured Baby Blanket, Ripple Afghan, Valentine Afghan, Towel Edging Duet, Fabulous Filet Part 6. . Mailing label on front cover, but otherwise very good condition.